1. 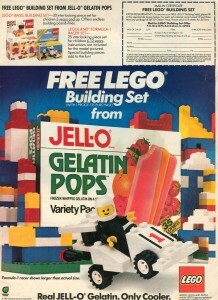 Jell-O Gelatin Pops – It seems like the Pudding Pops get all of the nostalgic love from Jell-O’s foray into pop technology in the 1980s, but I had a soft spot for their gelatin brethren. Remember these things? Instead of pudding, these came in all the flavors that regular Jell-O came in. I shudder to think about what was actually in them, but I remember them tasting pretty good. Except grape. For some reason the fact that the grape ones taste weird is at the front of my memory. Maybe it was the lack of Cosby that doomed this product to obscurity? 2. 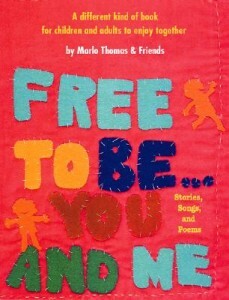 Free to Be You and Me – This was a compilation of skits, poems, and songs published by Marlo Thomas (and Friends) in 1972. I discovered the book in fourth grade , when my class performed the sketches for other schools around the area. I also used to act out the skits with my friends over the phone. The “and Friends” aspect of this project is pretty impressive, with folks like Roberta Flack, Mel Brooks, Michael Jackson, Alan Alda, Harry Belafonte, and a bunch of others. This talent was mainly present in the audio and video incarnations of this project. I read this book to death, and still have my tattered copy from fourth grade in my bookshelf today. 3. 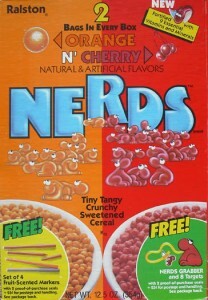 Nerds Cereal – As most 80s children know, a bomb of gimmicky cereals went off in the mid 1980s. Pretty much any property that could be shoehorned into being a cereal as well was exploited. Some were pretty spot-on representations and some just had no effort behind them. Nerds Cereal was in the former category. Nerds Cereal took the inherent gimmick of Nerds candy and just made a cereal version of it. There were two bags in each box, one for each flavor, and the box was divided down the middle. You could pour a bowl of cereal from either side of the box, depending on what flavor you wanted. Or you could mix them together! Also, if you ate enough Nerds Cereal, you could send your box tops off for a special cereal bowl that was divided down the middle as well, so you could enjoy both flavors separately. There’s nothing about this idea that’s not fantastic. Except that the cereal was gross. 4. How New York City Ate in 1938 – A little while ago, Gothamist shared this photo collection taken in 1938. 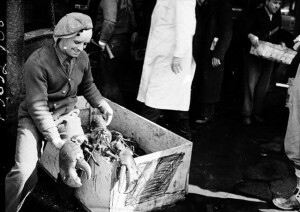 The photos show how New York City bought produce and kept sheep, and what diner design and fare was like back then. How things have changed! Look at this lobster! 5. Lafcadio – This is probably my favorite Shel Silverstein story. I’m not sure if it was ever very popular, but I read it to shreds. It’s about a lion who learns to shoot and travels to civilization to perform and become a celebrity. And discovers marshmallows and elevators. I remember bringing this book into school and reading the whole thing my second grade class. Next Post Two poems in Joie Magazine!